Purchasing a new South Jersey home, while an adventure, is a big decision with a lot of factors to consider. Any major purchase requires research, careful analysis, consideration and thought. 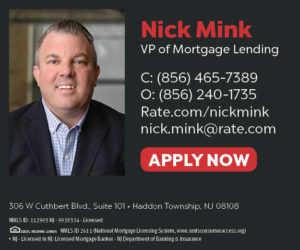 Many first-time South Jersey real estate buyers rely on the amount their bank is willing to lend them. Others use a mortgage calculator to determine their budget. Banks are often willing to lend buyers much more than they may be able to afford and calculators can be deceptive. The most reliable way to determine what you can afford is by manually calculating your expenses. A common rule is that your mortgage payment should be no more than 30% of your income. When calculating expenditures, be sure to factor in what your new cost of living changes will be based on the size of the home. Interest rates make or break a real estate deal as they can add a large amount to your monthly payment, costing thousands over the lifetime of your home loan. Improving your credit score can greatly assist with your interest rate. Often times, property taxes will be added to your mortgage payments. You can find property taxes for your area of interest by visiting the county’s website. HOW CAN HERRON REAL ESTATE AGENTS HELP? Been There, Done That And Ready For A Second Home, Vacation Home Or Investment Property? With more than 100 years of combined experience, our real estate agents are here to guide you from start to finish and beyond. Any realtor can sell you a property, but FEW have specialized knowledge and experience that this niche market requires, that’s why Herron Real Estate is at the top of our game ready to put our expertise to work! Ready to start your new home adventure? CLICK HERE to contact us!